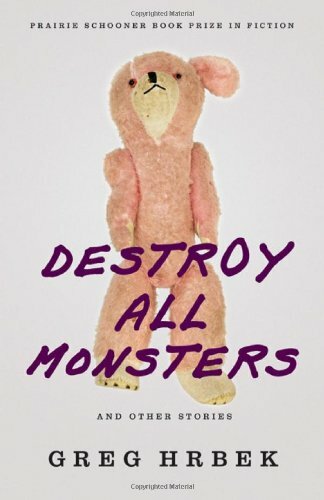 In Destroy All Monsters, Greg Hrbek offers a collection of stories that are linked by melancholy and sophistication, but distinguished by storylines that range from realistic to supernatural, engrossing to ethereal. Perhaps the best story is the collection’s first, “Sagittarius.” Two young parents argue over their second son’s apparent deformity—a hairy lower body with four lower-limbs that end in hoof-like bony knobs. The father favors a series of surgeries to make the boy “normal;” the mother is inclined to let the son develop as he was born. Then their son jumps his playpen and heads for the woods. As his parents take off in pursuit, their older son is left unattended. Alone, he wanders off. Mr. Hrbek’s subtle ending suggests a sad fate for one of the young boys. Other stories also mine the melancholy-supernatural with similarly satisfying results: For example, “False Positive” is built around a visit from a dead (aborted?) child to her father as he prepares to begin a new family. In “Bereavement,” a young couple grieves their dead child and feuds over whether to try again—even as the husband takes matters into his hands via do-it-yourself reincarnation. “Sleeper Wave” tells of a young father romancing an eccentric young woman who insists she’s a mermaid. When a rogue wave crashes on a beach and claims the father, readers must wonder whether this is tragic or planned. But not of all Mr. Hrbek’s stories use intelligent supernatural storylines. Stories such as “General Grant” and “Tomorrow People” are fully bound by the laws of physics and nature. In these, he offers characters dealing with the aftermath of violence. These are sad tales, but well crafted. Other stories are more complicated, and, perhaps, least satisfying. In “Destroy All Monsters,” the story that lends its title to the collection, Mr. Hrbek’s story flips back and forth between several different characters—each linked to the production of a Japanese monster movie. The story ends with a suicide of an American movie actor, but the linkage between the suicide and the movie or other characters is unclear. The story doesn’t end so much as it decomposes into ether. The same criticism could be leveled at least two other stories in the collection. At other times, Mr. Hrbek’s sentences are unnecessarily difficult, such as this one from “Tomorrow People:” “While Plaxico and I stood against the house in a scalene triangle of shade, and Omar, Hussain, Tarriq, and Khaleela jockeyed for position under the crank-and-tilt umbrella, Abdelkarim wandered nomadically in the solarized interspace of the patio.” The book is further weighed down by several page-long paragraphs that suggest an author unfocused on story. There is no doubt that Greg Hrbek deserves the literary honors cited in the bio on the book’s back cover. Nonetheless, Destroy All Monsters is uneven. At times, Mr. Hrbek seems to forget that—above all—readers want storyline in their stories. Destroy All Monsters proves that Mr. Hrbek is a talented author, but it does not prove him a consistent storyteller.